This program is designed to meet the specific developmental needs of the ever inquisitive two year old. It is our belief that children learn best by doing; therefore the environment is set up to allow maximum participation in classroom life. During the two-year-old year, children develop a new awareness of themselves as separate, unique people and they begin a new quest for independence. Our teachers respond to this need by not rushing to entertain or control the children, but rather quietly give lessons and redirect children who are struggling. Low shelves house a variety of appealing exercises for the child to explore independently. 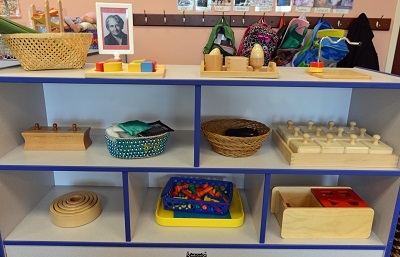 These materials offer a variety of choices to encourage decision making by choosing the “work” that calls to the child’s particular sensitive period. Each day the child experiences group lessons, singing, and movement as well as substantial time for independent, uninterrupted work. Snack preparation, self toileting, care of the environment, outdoor play, and gross motor activities round out the daily experience. The classroom becomes a home away from home where children feel secure knowing their physical and emotional needs will be met and they are confident to attempt new and exciting challenges.